Have you met Mr. Robot? The enigmatic hacker and the show named for him snuck out on the USA Network last year, only to become one of TV’s most talked-about shows. The second season begins tonight, but what if you haven’t had a chance to catch up on everything that happened in season one? Well, io9 has your back. When we first meet Elliot Alderson (Rami Maleck), he’s a socially awkward engineer at a cybersecurity company in New York City. The firm’s big client is the largest conglomerate in the world: E Corp, which is always called “Evil Corp,” because Mr. Robot is told from Elliot’s POV, and that’s Elliot’s opinion of it. He hates it because it has its tentacles wrapped around every piece of the planet—but also because his father died of cancer as a result of Evil Corp toxic waste. But Elliot isn’t just a morally conflicted engineer. He’s also a computer hacker who investigates everyone he meets. When he discovers a wrong that needs righting, he turns vigilante and uses his considerable skills to make it happen. And he isn’t just socially awkward—he’s addicted to morphine, and he’s very mentally fragile. One of his symptoms is extreme paranoia. He also tends to forget things, lose track of time at inopportune moments, and see things that aren’t really there. As the season progresses, his grasp of reality grows ever more tenuous. Which brings us to the second major character, Mr. 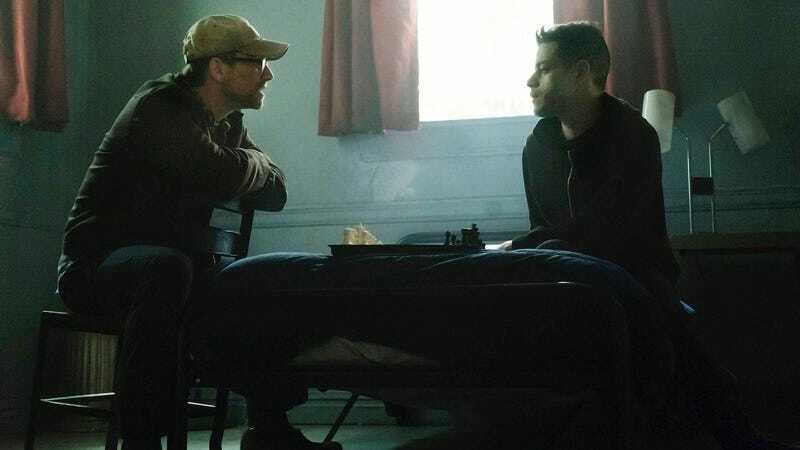 Robot (Christian Slater), a rumpled guy in a ball cap who appears out of the blue to entice Elliot to join fsociety, a hacker group plotting to wipe E Corp off the map and gut the global economy in the process. There’s something very odd about Mr. Robot that makes total sense when, late in season one, we realize that he’s Elliot’s father—or, more specifically, a hallucination of Elliot’s long-dead father that’s been guiding Elliot’s fsociety endeavors all along. Other important characters include Tyrell Wellick (Martin Wallström), a monstrously ambitious E Corp exec; heavily eyeliner-ed fsociety hacker Darlene (Carly Chaikin), who is later revealed to be Elliot’s sister—remember, he’s forgetful; and Elliot’s longtime friend and co-worker Angela (Portia Doubleday), who doesn’t know about his hacker activities but shares his loathing of E Corp, though she ends up taking a job out of desperation. But Mr. Robot’s third main character is you. Every episode is guided by Elliot’s internal ramblings that reveal what’s really going on inside his hoodie-covered head: panic, fear, wild speculation, somber introspection, a rundown of secrets about the person he’s with (learned by hacking into his or her email and social media accounts). But they are no mere voice-overs; they’re styled as one-sided dialogues with his “imaginary friend.” We’re privy to his thoughts, and he makes us part of the story—though we soon learn that Elliot can be a most unreliable narrator. Mr. Robot is a show that borrows liberally from other sources, and—as is befitting a show that never insults the intelligence of its audience—it knows that you know. The best example of this is probably when a piano version of the Pixies’ “Where Is My Mind” soundtracks a scene late in the season; by then, we’ve realized that Mr. Robot owes more than a passing debt to Fight Club, and repurposing the song that plays during that film’s finale is an affirmative wink. But though the American Psycho and V for Vendetta pop-culture vibes are strong, the show also references things that are all too real. The Evil Corp logo is basically Enron’s logo, but it’s more than that—the mood of the show feels alarmingly authentic. No other show has captured the current post-millennial anxiety and ennui so astutely, or accurately. Also: it never feels like it’s trying to hard to be current or cool, even though it totally is (a hacker lair secretly tucked into a Coney Island arcade? Awesome.) It’s full of stylistic choices that feel fresh and inspired (its soundtrack is killer). It’s amazingly well-acted, and though its subplots don’t always surprise (Elliot’s neighbor-turned-girlfriend, kidnapped by her drug-dealer employees, was clearly in a dead-end storyline ... literally), its commitment to making its main character a dizzyingly complex soul is always refreshing and even suspenseful. When Elliot’s in a scene, which he almost always is, you can’t trust your own eyes. How many other shows can you say that about? Mr. Robot ended on a most unusual cliffhanger, which it’s been dropping hints about via social media, but here’s where we’re at: the fsociety hack was a success. The world is in turmoil, with a revolutionary spirit building in the vein of Occupy Wall Street. While Darlene and company celebrate, Elliot wakes up in Tyrell’s car, unable to remember actually executing the hack or any of the days immediately following. All he remembers is Tyrell—freshly fired from Evil Corp, probably getting divorced from his creepy wife, definitely a cold-blooded murderer—showing up at his apartment, and taking him to the fsociety arcade. What happened during the missing days? Where is Tyrell? Did Elliot shoot him with the gun stashed in the arcade? Will the FBI trace the hack back to fsociety, Darlene, and Elliot? What’s the connection between Evil Corp and the Chinese hacker group that helped fsociety bring it down? Who was banging on Elliot’s apartment door? What role will Mr. Robot play, now that Darlene and Angela know the depth of Elliot’s delusions? And dammit... WHO IS TAKING CARE OF ELLIOT’S DOG, FLIPPER? Here’s a preview for season two’s premiere, which airs tonight on USA. It contains some hints to the above... but zero appearances by Flipper.